Join us downstairs in Theatr Colwyn, Wales' oldest operating cinema for a rare Ziggy Stardust screening preceded by a live Skype Q&A with Chalkie Davies. David Bowie's last night as Ziggy Stardust at the Hammersmith Odeon holds a special place in music history but is rarely shown in cinemas, don’t miss this one night opportunity to see it on the big screen at Theatr Colwyn. In 1973, after years of novelty singles, flopped albums, and brushes with fame that had never quite delivered, David Bowie was finally at the top of the rock and roll world with his most outrageous creation yet, the outer space rock and roll messiah, Ziggy Stardust. His breakthrough album "The Rise and Fall of Ziggy Stardust and the Spiders from Mars" about an alien who comes down to Earth to warn humanity of it's impending doom, only to fall victim to rock and roll excess, had made Bowie a household name, and a lightning rod for controversy. His flamboyant outfits and androgynous alien persona kept him in the public eye and under endless scrutiny. 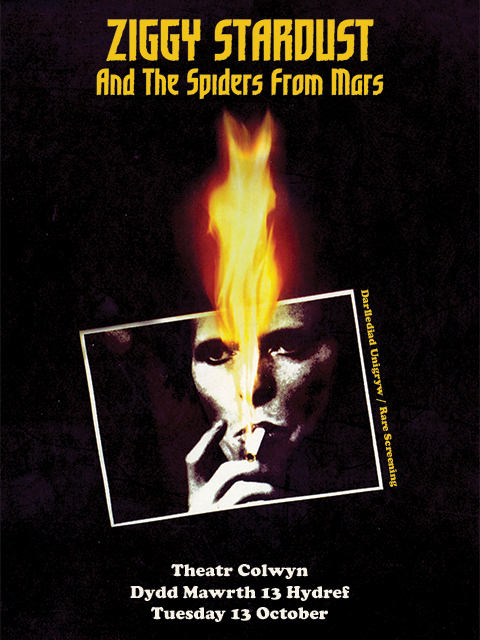 Ziggy Stardust & The Spiders From Mars: The Motion Picture captures all of the energy, the theatrics, and the electrifying rock of David Bowie in his prime as he performs his most daring persona one last time with the Spiders, who themselves had no idea this would be their last show with Bowie. The world of rock and David Bowie himself would never be the same again. Welsh-born Chalkie Davies officially joined the Rock and Roll Circus in 1973 after photographing this very concert. He then worked as a staff photographer at the NME from 1975-79 producing some of the most iconic music images of the era, many of which are on show in our current exhibition. Chalkie will be joining us on the big cinema screen via Skype from his home in New York City for a Q&A session before the film screening. Tickets for this event are available for FREE - BUT we would like to respectfully suggest making a donation of at least the £1.50 original concert price for each ticket to help support the gallery’s ongoing work.